Discover our premium instant espresso, crafted for espresso lovers. Savour a strong, rich taste with every cup. Topped with a smooth, velvety crema for that finishing touch. Made using 100% Arabica beans, carefully roasted for depth of flavour. An intense coffee experience, for those who prefer a shorter cup. 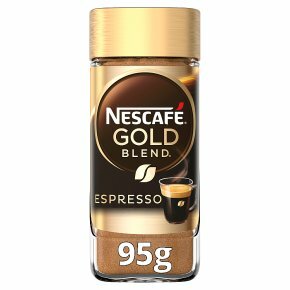 Savour the taste of 100% Arabica beans with NESCAFÉ GOLD Espresso. Prepare this drink in moments and enjoy a satisfying premium instant espresso at home. 1) Add 1 heaped tsp (1.8g) into your cup. 2) Pour in 50ml of hot water. 3) Relax with your quality espresso.